Stay updated with the latest promotions. To take advantage of the latest special offers available, schedule your appointment at our office in Farmington, NM today. Dear Valued Patient, thank you again for trusting us with your hearing healthcare needs. As the new owner of Sandia Hearing Aids, my goal is to continue the mission that David and Jessica Saxon started. At Sandia Hearing Aids, we value you and want to ensure that you receive the best care and service available and keep this tradition going forward. We’re reaching out today to share with you some exciting new technology in the hearing aid industry that is unlike anything we have seen before. Richer sound quality, an unrivaled streaming ability and integrated rechargeability are just some of the reasons that this technology is beyond compare. 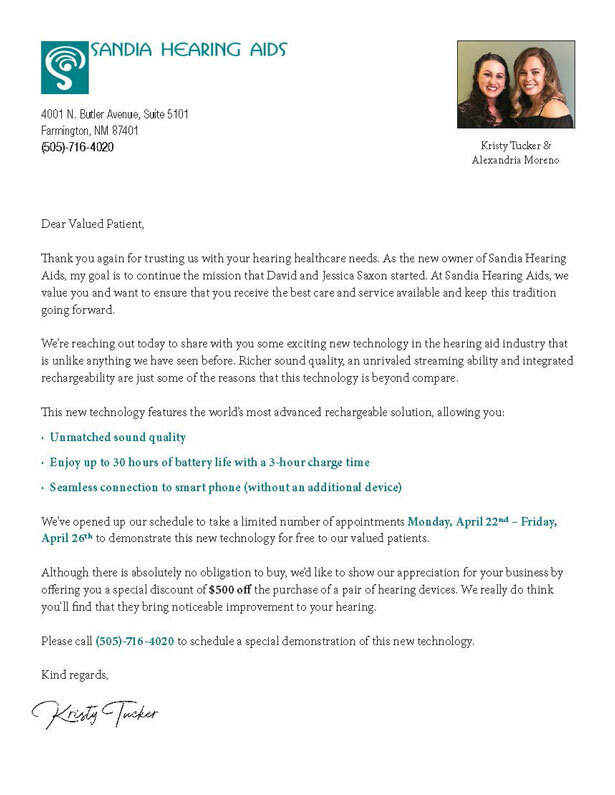 We’ve opened up our schedule to take a limited number of appointments Monday, April 22nd – Friday, April 26th to demonstrate this new technology for free to our valued patients. Although there is absolutely no obligation to buy, we’d like to show our appreciation for your business by offering you a special discount of $500 off the purchase of a pair of hearing devices. We really do think you’ll find that they bring noticeable improvement to your hearing. Please call us today to schedule a special demonstration of this new technology. Get a new pair of hearing aids and save $500 and experience hearing your best again! To take advantage of this $500 OFF savings, print this coupon and bring it at your appointment. Limited time only! Call now to schedule an appointment!